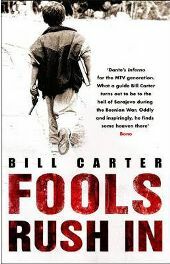 “‘A Dante’s Inferno’ for the MTV generation” – Bono’s verdict on Bill Carter’s “Fools Rush In“. Not much of a recommendation for me; sounds like a load of pompous rubbish. For years my opinion of Bono has swayed from ‘short-arsed rock singer’ to ‘head up his own arse rock singer’ but for one positive interlude somewhere in the middle. This respite (for which Bono no doubt thanks me profusely!) is the subject of “Fools Rush In”. When American Bill Carter found himself needing some excitement he managed to get himself a place on one of the volunteer aid convoys taking food and medical relief into the besieged town of Sarajevo during the bitter war in the former Yugoslavia.